was served breakfast in bed by my hubby and son, and given a homemade card and certificate from my son. I watched my son perform in Prince Caspian: Return to Narnia in our local children's theatre. He plays two characters – Lord Gloselle and Werewolf. He is so gifted! My hubby waited on me hand and foot (literally got a foot massage). It was a good day. 2. What is your favorite dish that your Mom makes? This is tough… she makes several things I love, but I guess I'd say her meatloaf and mashed potatoes — they're to die for! 3. Who are you a "Mom" too? Cody. The most beautiful soul and love of my life. 4. What did you have for Mother's Day dinner? 5. What is your fondest memory of your Mom? I have so many fond memories. I do love thinking about all the times she would get up and dance with my sister, brother, and myself. I also thinking fondly of her laughter. She is really a funny woman, although I know she wouldn't never describe herself as funny. 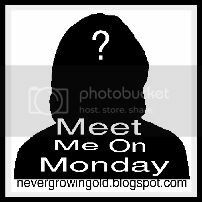 Meet Me On Monday: Do I have a secret?